Unlike some of its sports sim contemporaries, MLB The Show hasn’t really struggled in making the jump from console generation to generation. The two PlayStation 4 released entries have maintained the same solid core of the series, while also evolving into a graphical showcase for the console. The series’ main problem has been trying to innovate and evolve from a gameplay perspective. Not helping matters is the fact that its only competition comes from MLB Advanced Media’s budget R.B.I. Baseball franchise and the excellent, but not licensed, Super Mega Baseball. With MLB The Show 16, Sony San Diego continues to tinker with the formula in mostly minor ways. 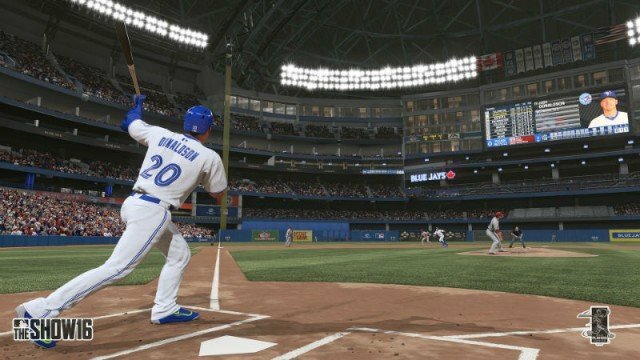 Improvements in this year’s iteration of the franchise can be seen in everything from player models and stadium designs to Diamond Dynasty and Franchise mode. Depending on how you want to look at it, you can either see this is as a franchise that adheres to the philosophy of don’t fix what isn’t broken, or a series that is spinning its wheels. 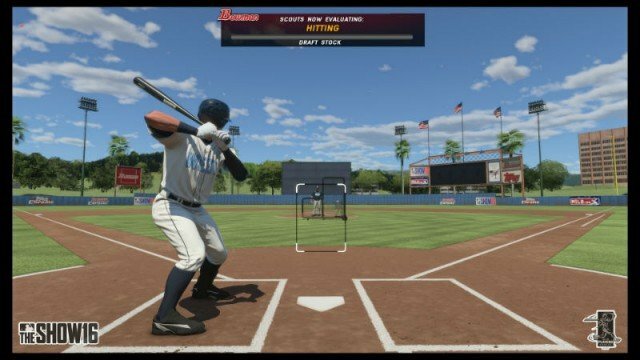 Last year, The Show introduced directional hitting to the core batting gameplay of the title. This year, the basics of batting and pitching are kept in place. Both sides of the war between pitcher and hitter still have several control options to choose from. I typically stick to regular, button-based hitting, but this year I opted to make the change from meter pitching to pulse pitching. You probably don’t care, but I have to say, I did find myself falling in love with pitching once again. Not everything is old, though, as the new Showtime ability can change how you approach certain moments. During big time situations, or I suppose really any moment in-game, you can slow down the action in order to make a big time play. If you’re in need of a hit in a high pressure situation, you can slow down time in order to get a lock on the pitch. Or, if you’re trying to make a tough catch, you can slow things down in order make a highlight reel-worthy grab. If you’re worried about people possibly abusing this system, don’t worry, Sony San Diego is keeping the ability in check by both keeping it tied to a meter and, if you’re in Road To The Show, limiting it based around certain perks you have equipped. Although most aspects of the gameplay remain the same, Sony San Diego did fix one of the bigger issues I had with last year’s release. 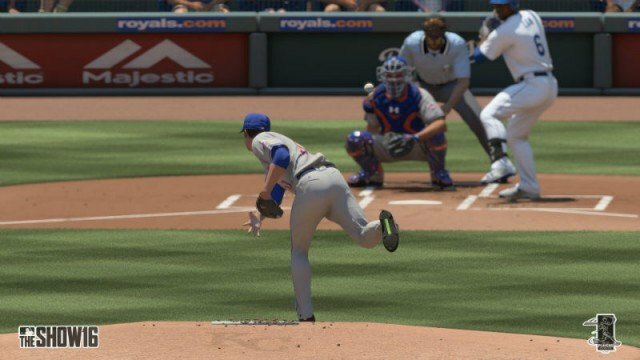 In The Show 15, I felt that the fielding was surprisingly stiff and unresponsive. This year, though, the fielding feels more intuitive and smoother than it previously did. The improved routes fielders take to balls in play is also something to pay attention to. Outfielders react more realistically to flyballs, with a greater emphasis being place on common errors that happen outfield. Speaking of Road To The Show, MLB The Show 16 introduces a few new features that manage to make the best mode in the franchise even better. New to this year’s edition is the inclusion of the Bowman Scout Day, which is part of the Topps Prospect Showcase. At the Scout Day, potential MLB players will now be graded on the 20/80 scale that actual scouts use when evaluating players. It may not change the way you approach the mode, but realistic scouting makes the mode feel even more true to life. Another pleasant addition to the mode is the fact that you can now play several games in a row without having to return to the main menu. Also new to Road to The Show this year is the addition of gameplay perks. Based around what stats you choose to improve, these perks grant your player new skills and abilities. Examples of some of these perks include the ability to moderate energy when you become tired or increasing the rate at which the other team commits errors. While some of these abilities last all game, others may only be used a few times per game. While I still think Road to the Show is the best aspect of the title, I do wish that there was a little more personality involved with the mode. I harped on this in my review of last year’s release, but I want to be able to have greater interaction with my coaches and teammates. Clubhouse dynamics are always being brought up as a fundamental part of baseball, so why not find some way to implement that into your created player’s career? If nothing else, give me the option to call out my teammates for the lack of run support. Building off of the improvements found in last year’s version, Diamond Dynasty continues to evolve into a solid competitor to EA Sports’ Ultimate Team. Like that popular mode, Diamond Dynasty has players building a team through collecting cards. Cards can be acquired through either buying cards with real-world money or earned in-game currency or by playing online. Besides fresh season updates, new cards this year include more legends and flashback cards, which are cards of certain players at special points in their career. Inside Edge Daily Ratings will also be incorporated into the mode, with cards having dynamically changing attributes depending on their real-life match-up that day. While there is still plenty of grinding to be done, some of the tedium of collecting currency to buy packs has been alleviated thanks to the implementation of missions and captains. Missions are what they sound like, as players can complete certain tasks, such as collecting 25 cards from a certain team, in order to earn money to buy more packs. Meanwhile, you can align with one of seven captains (which includes popular players such as Jacob DeGrom and cover star Josh Donaldson) in order to gain access to exclusive rewards and missions. These additions most likely won’t change the minds of those opposed to the mode, but I appreciate that I don’t have to grind away at the same tasks in order to make money. Besides the traditional Diamond Dynasty mode, MLB The Show 16 introduces two off-shoots of the mode. Battle Royale has players taking part in a double elimination tournament with a team they created through a 25 round draft. The more games you win in the tournament, the better the reward. However, if you lose too many games, your entry will be revoked. It’s tough, but the high-stakes pressure of the tournament makes a sport that can sometimes feel stale thrilling to take part in. The other new mode, Conquest, is a little bit different. Playing like a MLB-styled take on Risk, Conquest has players taking their team across the country. Your goal is to become the most popular team in North America, and the only way to do that is by gaining new fans through victories. Once you beat an MLB team representing a certain area, you’ll take over that location. The more territories you hold, the better the prizes you will receive. It sounds a little silly, but in some ways, it’s actually an accurate description of the way fans respond to good teams. Think of how many Dallas Cowboy or Los Angeles Lakers fans you’ll find across the United States, and the mode begins to make a little more sense. Incremental improvements can also be seen in the returning Franchise mode. Tasking players with not only leading a team to success on the field, but off of it as well, the mode has been enhanced with more detailed information. The 20/80 rating scale is featured here, as well as a new system that forces you to deal with keeping player morale in check. Factors in this include making sure they are getting enough playing time, not clashing with the coaches and even where they are currently playing. The improved revenue and expenditure system helps give the mode more realism, as well. Now you clearly see how much money you are making, as well as where all of the money you spend goes. By giving you a better look into the money behind your team, you can be better prepared for dealing with player contracts, as well as the true to life budget dynamics of Revenue Sharing and the Luxury Tax. 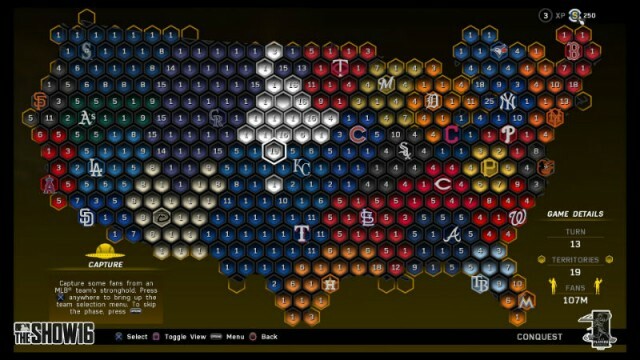 Even with all of the new systems and information in place, I never felt out of my league when it came to Franchise mode. Sony San Diego has done an excellent job of presenting all of this information in a way that is simple to understand. I also enjoyed being able to delve deeper into contract talks with free agents. Bargaining with players over not only money per year, but also playing time is a thrill to the frugal spender in me. If you’ve spent the past few years avoiding the mode, I think the assorted additions here warrant at least another shot. Somehow, MLB The Show 16 even manages to make improvements in the visual department. The franchise has been one of the best looking titles on both the PS3 and PS4, and this year is no different. The player and coach models both look incredible, although some players clearly weren’t scanned in. The stadiums, which now give players the option to open and close the roof if possible, have also been improved. Utilizing the new Physics Based Rendering system, Sony San Diego has detailed every nook and cranny of the ballpark. Everything from the phone in the dugout to the shadows behind the foul post has been re-rendered. It makes the title look uncomfortably close to the real deal. Besides the look of each player, significant improvements have also been made to the animation system. The game features over 400 new animations, which run the gamut from player specific movements to basic fielding animations. For example, Jose Bautista’s epic bat flip from Game 5 of the ALDS is here, as well as Edwin Encarnacion’s unique home run trot. Besides looking cool, these new animations help depict the game in greater detail, as these unique celebrations are part of what makes the sport so enjoyable to watch these days. Last year, The Show felt like a star player that was content to rest on its laurels. This year, though, MLB The Show 16 went to work in order to become the best it could possibly be. The gameplay continues to be rock solid, and the various tweaks to the modes found in past iterations of the franchise all prove to be worthwhile additions. The franchise still isn’t perfect, though, as Road to the Show could use a little more personality and the commentary continues to be an issue, even with newly recorded dialogue. Still, Sony San Diego’s sports franchise has once again laid claim to the title of being the best sports sim around. This review was based on the PS4 version of the game, which we were provided with.